A mason jar is one of those things that can be used for anything and everything. There’s always something cute, and fun that can be done. 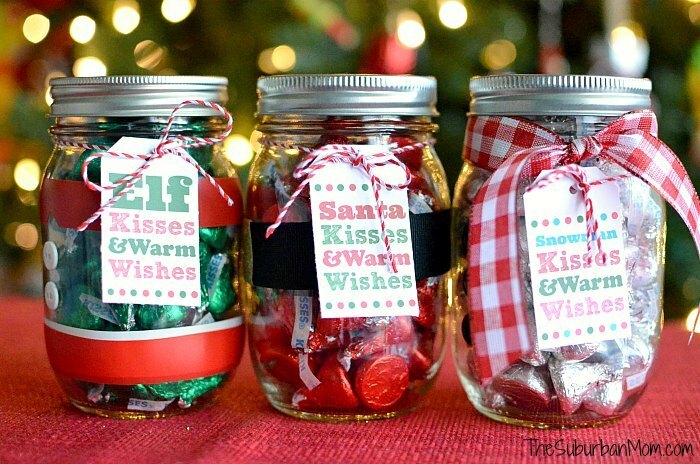 Mason jar Christmas crafts are really simple and easy to do! All you need is a little creativity and a little time to create something truly beautiful. Here are 6 beautiful mason jar Christmas crafts to try this holiday season. This can be easily done by spray painting a mason jar gold and putting fake, or real flowers inside it. You can add a little extra sparkle by putting gold glitter on it too. The good news is that by changing what you put inside the vase, you can use it for anything. It would look adorable at a baby shower with little pink or blue flowers! How cute is this DIY candle? Instead of buying expensive candles, make your own and you’ll be able to customize the scent. Have several around your home to create a Christmas ambiance or make more to give to friends and family as gifts. Gifts that you make yourself are really special and mean a lot to the person receiving them. Create a tiny little winter wonderland inside a mason jar. 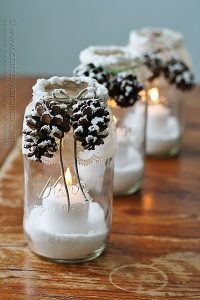 Make snowy pinecones and put fake snow inside the mason jar as well. This mason jar Christmas craft would be beautiful lining an entryway or walkway. You can put real tea light candles inside the jars, or buy battery operated ones. They’ll bring a little more light into your life. 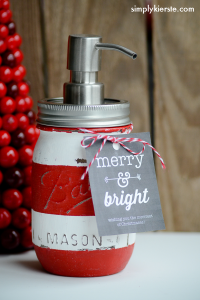 Paint your mason jar a fun holiday color or pattern. Then just fill the jar with your favorite soap and put a dispenser on the top! You’ll have a unique soap dispenser for the Christmas season. This also makes a great gift for friends and family. Use a cute printable tag to hang on it and it’ll look even better. A Christmas party wouldn’t be complete without some elegant centerpieces. These are easy to make and look beautiful as they light a dinner by candlelight. All you need are little candles, cranberries, ribbons, evergreen branches, and mason jars. Fill the mason jars with water and let the cranberries and the candle float at the top. 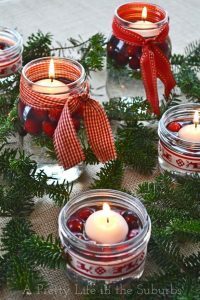 Tie a cute ribbon around the mason jars to add some extra flair, then drape evergreen branches around them. Simple and delicious, this makes a wonderful gift. 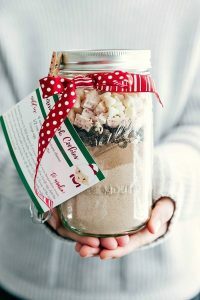 Fill the jar with everything someone would need for peppermint bark, except the wet ingredients. Tie a ribbon around the jar with the recipe attached and you’ve got yourself the perfect gift to give. It’s really easy because all you need to do is put ingredients into a jar, but it really shows people you care about them because you took the time to do it. 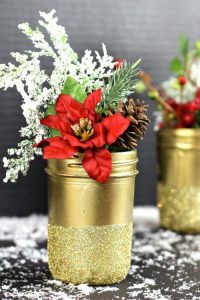 Mason jar Christmas crafts are so simple and beautiful. It’s amazing how such a simple glass jar could create so many different but equally beautiful things. From centerpieces and candles, to peppermint bark and soap dispensers. 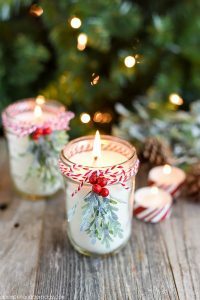 Your friends and family will love these mason jar Christmas crafts as gifts, or as part of your holiday decorations in your own home.